HAPPY THANKSGIVING FROM ALL OF US AT COLUMBIA BUILDERS! - Columbia Builders, Inc.
Wishing everyone a safe and happy holiday, along with a special note of heartfelt thanks to all of our homebuyers, past and present – we appreciate the opportunity to work with you! a little bit of sunshine for the colder months ahead. Happy Thanksgiving! 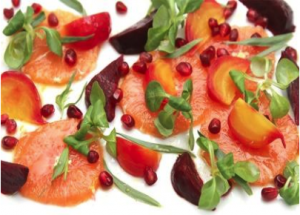 We’d like to share an awesome recipe with you all for a pomegranate, beet, and blood orange salad. *A thick pomegranate syrup available at specialty markets and online. You may also use cranberry juice concentrate as a substitute. Preheat oven to 400°F. Place beets in roasting pan and toss with 1 tablespoon oil, 1 teaspoon salt, and 1/2 teaspoon pepper. Add 1/4 cup water. Cover pan with foil; roast beets until knife easily pierces center, about 50 minutes. Cool. Peel beets and cut into 1/3-inch-thick wedges. Whisk orange juice, pomegranate molasses, vinegar, and remaining 2 tablespoons oil in large bowl to blend. Add beets, onion, orange slices, and pomegranate seeds to vinaigrette in bowl; toss. Season salad with salt and pepper. This entry was posted on Tuesday, November 20th, 2018 at 1:55 pm. Both comments and pings are currently closed.